"A useful tool for teaching CV phonemes to independent learners. It can be used by a speech-language pathologist in a school or clinical setting. It can also be used by parents to practice with their children at home." - Ricki Block, MS, CCC-SLP. Speech Pathologist since 1976 and certified member of the ASLHA. “The syllables are arranged in a hierarchical order, which is hugely important. Parents can use this app to practice at home what was taught in therapy." - Jackie Bryla is a school-based SLPA in California. 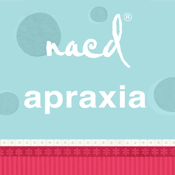 Developed by the National Association for Child Development team, including a certified speech-language pathologist, the Apraxia app provides choices of different phonemes to target and moves through a progression of levels that challenge motor planning for speech. Working at the syllable level, it begins at the production of single syllables and progresses through increasingly difficult production sequences all the way to the production of sequences of random syllables. • Choose from 8 different consonant groups (for a total of 19 consonant sounds) to target. • Detailed instructions explain how to choose an appropriate consonant group and practice level. • Move through a logical progression of 8 different levels for motor planning for speech. • Illustrations and audio provided for each syllable. • Option to repeat levels, reset, or move to next level. • Can also be used for straight articulation drill for particular phonemes.